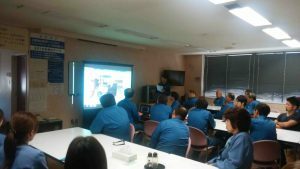 This photograph shows Kaizen presentation meeting held at Company K which I visited the other day. Once a month in Company K using 30 minutes after lunch several people present their recent Kaizen in front of all the members. I propose a method of Kaizen called “Choko-An”. The content of topic No.7, ” The president does Kaizen, too “, is this Choko-An and Company K carries out this method. I recommend to hold a presentation meeting of Kaizen because it is very good way to carry out Kaizen in order to obtain a big fruit continuously. Speaking in front of many may make presenters a bit nervous, but memorizing speech is unnecessary because the Kaizen is done by oneself. I ask them some easy questions about the difficulty they had while doing Kaizen, concerning about what kind of result was produced and why you did it while showing photographs with a projector. Everybody who hears such stories understands the whole company situation related to other fellow workers and other section matters through the information about the trouble that the people encountered and the result of the Kaizen. And finally, a small gifts are handed to all presenters after the plant manager evaluating those Kaizen, and praising their effort. There might be so many people who are not good at talking in front of people, but they can surely talk by all means because those Kaizen are carried out by themselves. And proper preparation can be transferred to everybody well. Because the talking power proportionally increases the thinking power, so you will understand that Kaizen power improves along with this way. Then with the challenge of all the members, they can prepare for the severe change in the future.